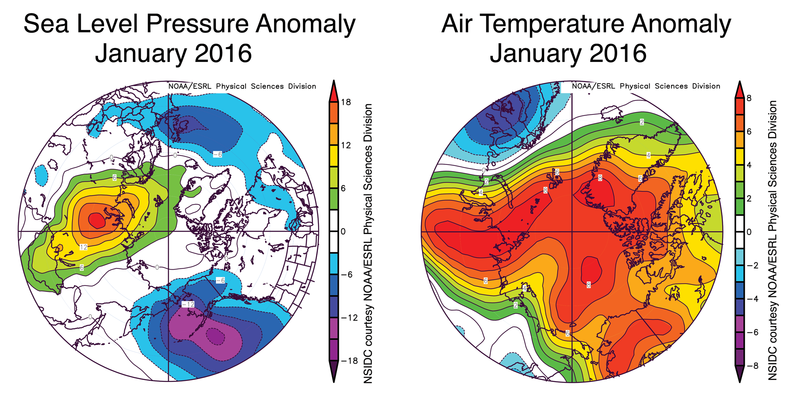 With an El Niño nudge, January saw record high temperatures. But accumulating greenhouse gases are the long-run cause of global warming. January saw an extraordinary, record-setting spike in global average temperature, according to the just released monthly analysis from NASA’s Goddard Institute for Space Studies. The global average temperature at Earth’s surface for January 2016 was 1.13 degrees C above the 1951-1980 average. That’s slightly more than 2 degrees F. The previous record for January, set in 2007, was .95 C, or 1.71 F above average. NASA’s climate record goes back to 1880. The super El Niño pattern that we’re still in right now hit a peak in January, and that no doubt played a role in this global temperature spike. You can see it’s direct influence in the form of that spear of very warm Pacific Ocean water jutting out from South America along the equator, with associated warmth over the continent itself. The trend over time is why we’re having a record warm year. The black line in the graph above shows the annual mean temperature anomaly, and it takes us only through 2015. So it does not include January 2016. But the overall trend is clear. The red line showing the 5-year running mean smooths out the year-to-year natural variations — like those caused by warm El Niño phases (1997/1998, for example), and cool La Niña phases (1999/2000). As a result, it shows the long-term trend even better. The map at the top of this post shows that extreme warmth in the high latitudes of the Northern Hemisphere played a key role in driving global temperatures up in January of 2016. So does the graph to the right. (Click to enlarge.) It shows how temperatures departed from the long-term average along each band of latitude. To the extreme left in the graph is the South Pole (where the United States has a base). From there to about -60 degrees latitude, temperatures were actually a bit below normal. The map above shows this too. Warming of the atmosphere resulting largely from our emissions of greenhouse gases has caused Arctic sea ice to retreat in extent. The result: increasing amounts of dark sea water are exposed. In summer, sunlight that would ordinarily bounce off bright ice and snow now strikes the increasing extent of open water. Dark surfaces are very good at absorbing energy, so waters warm. And some of that warmth is re-radiated into the atmosphere, thereby magnifying warming in the Arctic. Amplification of human-caused global warming has caused significant ecological impacts in the high north, as well as impacts on local, indigenous communities. SEE ALSO: Whispers of ecological change in the Arctic are trying to tell us something. Are we listening? “Indigenous peoples are running out of time and are having fewer opportunities to adapt to changes,” said Aili Keskitalo, president of the Sami Parliament of Norway, speaking at the 2016 Arctic Frontiers conference in Tromsø, Norway. The Sami people have been reindeer herders, and their traditional livelihoods are now threatened by a warming climate. I’ve emailed several experts to get further explanation and commentary about January’s record-setting global temperature. As soon as I hear from them, I’ll update this post. So please check back. We generally don’t comment on single months because there is a lot of variability there and our main focus is on the long term trends, not the vagaries of weather. For short term variability you are better off talking to meteorologists, not us. So here’s my take: NASA GISS is funded by taxpayer dollars to do these analyses, and it makes them public every month. By not providing any expert guidance in interpreting what the data mean, GISS scientists are missing an opportunity to do public education that would prevent just the sort of misinterpretation they may well fear. I also don’t believe any of my questions were beyond Gavin Schmidt’s expertise. That said, his reply did get me to thinking about the way I handle weather, on the one hand, and climate on the other. As a science journalist who writes about these issues very often, I find that it is all too easy to forget to make the distinction crystal clear. I also worry that writing about each monthly report could be misleading. A single month does not constitute climate. Twelve months times 10 (a decade) does. By focusing on such a small time period — four weeks — am I helping to sow confusion on this issue? I surely do not want to. In this post, I did try to put the monthly report on global temperatures into the context of the long-term trend. And I also tried to explain proximate meteorological factors, such as the Arctic Oscillation. I thought I was finding the right balance between explaining weather and providing the long-term climatic context. But perhaps I need to do better. With all of this in mind, I’m thinking about doing an entire post on weather and climate — an explainer that could help us all sort out the complexities. We’ll see. Lessee, even the UAH satellite data reports January 2106 as the warmest January since their records began. It will be interesting to see how the hard-core deniers spin this. Most of them depend on the anomalously hot El Nino year of 1998 to buttress their bogus claim of “no warming for 18 years.” Let’s see if they are so hypocritical and evidence-averse as to dismiss this sign of accelerating warming as “anomalous”. The entire past year has erased any uncertainty regarding a “pause” in the warming. We’ve seen record after record with each month, and this year appears set to continue that trend, itself part of the overall long-term trend in warming temperatures. Apparently, the oceans are only soaking up so much of the heat (part of the supposed “pause” before giving it back. But you’re right — as the post from Odin’s shown, this evidence only encourages more inventiveness on the part of those who simply can’t accept mankind’s role in raising the global temperature. I’m sure we’ll see one or two others show up before long to contribute some politically inspired rants against accepting scientific fact. Nonsense and idiocy disguised as illiteracy. The trend is up, up, up, even in the satellite measurements, which are not direct measurements of air temperature but rather measurements of microwave radiation emitted by oxygen molecules tens of miles away, that must be fed into models, including adjustments for orbital decay and atmospheric parameters, in order to estimate temperature. 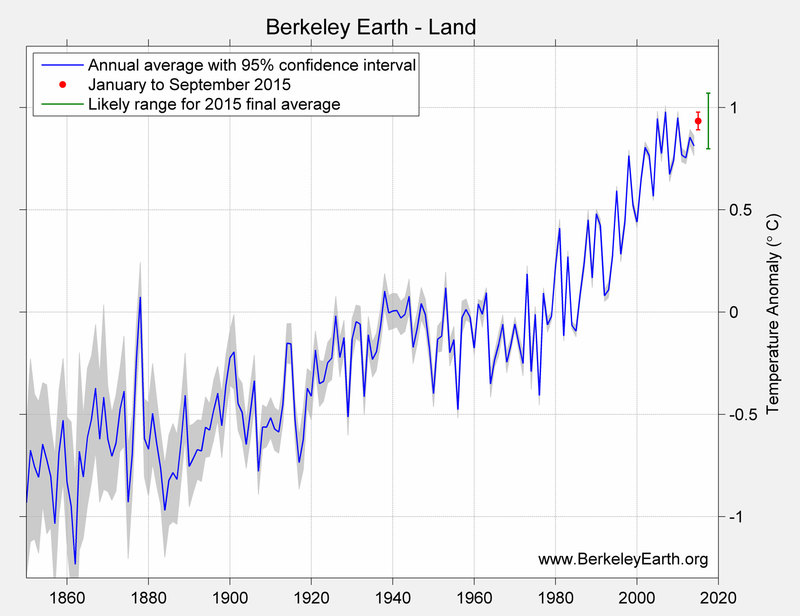 Land temperatures are up about 20% more. And 90-95% of heat is trapped in the oceans, which have been warming to the tune of 5 Hiroshima bombs per second over the last quarter century. Your Arctic is melting, about 13% per decade; Ice thousands of years old is disappearing every summer. Shameful ignorance or shameful mendacity? It’s one or the other, no matter how bad your English. How good is your norwegian. Are you useing Hiroshimabombs to measure ocean heat now. How many bombs of heat does the ocean hold as a total. I guess this massive build up of heat will transfer to the amosphere some time soon or. Is NOOA’s huge fleet of satellites a waist. Southern hemisphere is getting colder thats a fact and the south pole is not going to melt. I do not attempt to post in languages other than those I speak well. The increase in total energy of the earth system has been enormous–and has indeed translated to (rapidly) rising temperatures, in ocean and on land–as even your own links to the satellite data show (and temperature modeling from satellite microwave data are by no means “the” definitive dataset–only one of many). With that, we also know that the oceans have been absorbing more than their share of energy since about 1997, and that pattern has been shifting of late–resulting in the unprecedented temperatures of 2015–and now 2016, with more on the way. Arctic melting produces positive feedbacks aside from impacts on sea level. The Southern Hemisphere is not warming as quickly as the northern, but it is most certainly not cooling. Another loaf of total nonsense from you. That the Antarctic ice sheet isn’t melting away anytime soon is true–but there is enough ice on Greenland to flood many of our major population centers (which, incidentally are predominantly situated in Northern latitudes). To sum up, you and your ilk are despicable. That’s a little over the top, and if our erstwhile moderator was in the least bit consistent, he would tell you so. I’m tired. Have a nice day. Thanks Tom, no need for us to fight. You have my best regards, and my respect for your opinions and the serious effort that goes into producing a most interesting and amazingly illustrated blog. But that should please you, as it is certainly one that is followed by a lot of your avid readers. If you look at the posts you will see that the invectives and ad hominems usually comes from one side of the debate. It is to these folks who just repeat the dogma, and insults, but can never seem to follow their own illogic to a realistic conclusion, that my ire is directed. As always the opportunity to comment is much appreciated. Thank you Mr. Wilson for the pat on the back. I appreciate it. And for the record, I’m not tired because of the comment section of the blog. I just like doing too may things, so as a result I do too many of them for too long. But I’m really not complaining. data never revealed before. ALL Satellite DATA from 1979 to 2016…all of it. More water south…and the energy absorbed is a bit delayed….but it is coming. Just a small quibble. I believe that the 5 Hiroshima bombs a second is the current rate. The average over the last 25 years is closer to 4 Hiroshima bombs a second. I actualy read the report. Its a sientific blunder were the writer first state that warmer seas will store less heat. then telling the public that oceans has stored the same amount of heat last 15 year that did in the first 150 years of the so called of unnatrual human heating of the globe. just to use hiroshima bombs as a measurements tell us that this i activism not sience. A UK Science team declared that the last 20 years has been the HOTTEST 20 Year PERIOD in recorded history. **Almost immediately science teams in several countries decided to challenge the claim. **HUNDREDS of ICE CORES were examined in detail…instead of disproving the claim, they verified AND extended it. **The last 20 Year Period has been the hottest in thousands of years…hotter than the European Medieval Warming and hotter that the Roman warming….by quite a margin. **They found CO2 in our atmosphere is a higher level than found in hundreds of thousands of years. **Methane is higher than in well over a millions years. **Other teams examined SOIL CORES and still others examined tree rings. …all verified that the last 20 years have been hottest in thousands of years…. boats would be viewing the drowned towers of Miami through 150 feet of tropical water. Denier are prepared to give their Etch-a-Sketch a good shake and start over with a new baseline of 2016, or 2017 (whichever ends up being warmer), and from that point they will provide abundant evidence that there’s another hiatus, or perhaps even cooling. Of course another record year will come along in a few years, and they’ll have to start yet another time series. For those who do begrudgingly accept that the earth is warming, there are many options to choose from that preserve the denier’s core beliefs. For example, there are the conspiracy theorists who claim that the government is intentionally warming earth in order to impose whatever it is that deniers fear will be imposed. They have an unlimited capacity to improvise alternative hypotheses to explain away science and reality. Were is the huge temperatur raise in their satellitt data. I’m not particularly interested in how much warming there is 5 miles up which is the lowest the satellites measure. I live on the surface, my food comes from the surface. The surface temperature is what matters to me. Well you can all take a look at the data your self. Now please tell me were the huge increace in temperatur the last 18 yeas is manifested in their satellitt data. Spencer used to put a sine-wave through his data, “for entertainment purposes only.” Unceremoniously removed it several years back. They also lean heavily on estimates of stratospheric temperature from numerical models. They’ve been told over and over that those estimates are “satellite data” which are “more accurate” than measurements from actual thermometers at Earth’s surface. The president (Carl Means) of the company (Remote Sensing Systems) that packages the satellite estimates says they’re misusing his company’s product. But deniers never let facts get in the way of an emotionally appealing talking point. NO! They haven’t been told over and over that satellite data is more accurate. 1.Satellite’s do not measure temps. they require radiance interpolation and then manipulation to come up with temperatures of sorts at a thousand feet or so. 2.Satellites generally TRAIL ground level temps trends since they are sampling THAT high. 3.Even RSS web site declares Ground Stations are more reliable. Give the 1st Graph a quick left to right once over….along that BLACK CENTER Line. WHERE are the most temperature dots left of center (1979)….?? WHERE are the most temperature dots RIGHT of center. (2016)…?? Lindzen is not “a climatologist at the Massachusetts Institute of Technology.” He retired three years ago, to pursue a career in “free market” political advocacy. But what would you expect from Daily Caller? Having trouble finding something to smear Lindzen with? The CV on that page was last updated in 2010. The correct title would be Professor Emeritus. But if they haven’t appointed a new person to the Alfred Sloan seat, I suppose he can still use that title instead. Linzen did a lot of good work a long time ago. Recently, he became a full time public relations man for the fossil fuel investors. Whatever. Sneer and smear is all that you have. Is is more accurate to say that he is free from the shackles of government funding. He can speak his mind. Sneer and smear is all fine, all part of the game. What climate scientists have that makes a difference is EVIDENCE of global warming, in temperature measurements, sea level rise, ice mass melting, etc etc. And EVIDENCE that greenhouse gas emissions are by far and away the largest forcing of the observed warming. You are apparently impervious to the glacial weight of the evidence, and cling to the dubiousness of a scientist who, let’s be charitable, is not at the top of his game. Appeal to “authority” is all you have, and it is a mighty weak argument against the mass of evidence for AGW. You are projecting. Provide one or more scientific journals showing by empirical evidence that humans (primarily Anthropogenic CO2 emissions) are the primary cause of global warming at any time. Both of the satellite data sets (RSS & UAH) show that there has been no global warming in the past 18+ years despite increasing CO2 emissions during this period equal to 1/3 of the rise in CO2 since pre-industrial times. If CO2 emissions were a direct and significant cause of global warming, we would have experienced global warming during the 18+ year pause. We did not. There is no empirical evidence showing that CO2 emissions are the primary cause of global warming. The hypothesis about human caused global warming (AGW) is not supported by empirical evidence. The hypothesis is based on computers which overemphasize CO2’s role in climate change and de-emphasize the role of clouds, solar cycles, ocean cycles and other natural causes of climate change. These computers have been notoriously wrong almost all of the time (when compared to real world data) and have been compared to a sports team that played the entire season without winning a game. Computers that model an imaginary planet and are programmed with guesses of a few of the many variables affecting climate are not data or empirical evidence. Ninety-eight percent of the climate models relied upon by the IPCC failed to predict the 18 year and eight month pause and their projections of future temperatures during the last 20 years substantially exceeded the observed temperatures during this period. The outside atmospheric levels of CO2 are currently around 400 ppm. During the last ice age CO2 levels fell to 180 ppm and plants started to shut down. If CO2 levels had reached 150 ppm or lower, plants would have died off and all plant and animal life on the planet would have died. Green houses regularly keep CO2 concentrations at 1000-1200 ppm because the plants grow better. In the past, CO2 levels have been at several thousand parts per million and plants and animals thrived. US submarines try to keep CO2 levels below 8,000 ppm. Federal OSHA standards set CO2 maximums at 5,000 ppm. When you exhale, your breath contains more than 40,000 ppm CO2. The most predominant greenhouse gas is water vapor and increased CO2 levels are greening the planet. We are much closer to being CO2 deprived than we are being threatened by too much atmospheric CO2. Plants thrive on more CO2- that is a good thing. CO2 is not a pollutant. It is a weak greenhouse gas that is colorless and odorless which comprises only .04% of the atmosphere (naturally occurring CO2 + CO2 emissions). CO2 emissions were only 3-4% of the total CO2 in the atmosphere. So, CO2 emissions make up only .0012 to 0.0016 % of the atmosphere. That is why blaming global warming on CO2 emissions is like having “the flea wag the dog”. Climate change is natural and has been occurring since the formation of the planet. The 18 year and 8 month pause just proves that the skeptics were right all along-natural causes of climate change are more powerful than the insubstantial effects that human generated CO2 has on the world’s climate. OK. I’m convinced. You are obviously a vaunted scientist, a true outdoors-man, the master of Google and links. I will ignore my hundreds of links that dispute your few. Let’s go ahead, burn more fossil fuels and pollute the planet with more carbon dioxide. That’s what you want, right? If its possible we might make things worse, so what! Who cares if nations and segments of society battle over water and food? People suffering from heat and draughts all over the planet? Big deal! We humans have no affect and can do nothing to change it. So, we may as well continue polluting. I mean, those cites in China and India (with skies dark and dreary) don’t really seem to be suffering much. Probably just a hoax. We can deny it. Hey! We can be like the planet Venus in a hundred years or so! Cool. I won’t care, I’ll be dead. Apparently, you have no empirical evidence substantiating the AGW hypothesis. You feel mocked? Thin-skinned, huh? Sorry, did not mean to hurt your feelings. Do you REALLY want me to post about 100 links? You got links, I got links. Look, greenhouse gases from human pollution, since the start of the Industrial Revolution, builds up in the upper atmosphere trapping radiant Earth heat which then gets absorbed into sea water raising sea temperature. That is basic freaking science! More energy coming in than leaving. Astronomy 101 – Atmospheric carbon dioxide acts like a thermostat. The Sun has always been up there. The Industrial Revolution is recent. Apparently, you do not understand basic science, and you obviously did not understand the point within my previous post. You look, but you don’t “see.” You GWDers always fail. Mocking is a Saulinsky technique. Left wing talking points are not empirical evidence. Provide one or more papers that show, by empirical evidence, that human activities (mostly CO2 emissions) are the primary cause of global warming at any time. Post your citations or shut up. Yeah, i have heard how many links people have and then you get 3 cittions, read them, and find they say absolutely nothing about the issue under discussion. there is so much b.s thrown in comments it amazes me. Odin2 has always posted citations for his statements and when i verified his information, he has been very accurate. i would not dismiss this man. He is well educated and must be an avid reader. That’s the usual “stuff” that get’s thrown against the wall, in the hope that some of it may stick, or at least get folks going in a circle. The statement: “No empirical evidence for human-made global warming,” is a common argument made by “Deniers.” Unfortunately, they have not looked very hard. Ice core analysis and observations at the Arctic, Antarctic, and in Greenland reveals similar temperature and CO2 trends consistent with the nature of greenhouse gases. Polar records show a close relationship between atmospheric carbon dioxide and temperature in the world. (climatechange.umaine.edu/iceccores; ncdc.noaa.gov/data-access/paleoclimatology-data/datasets) – the carbon dioxide didn’t come from the Sun! The web site, thinkprogress.org/climate, has so many listings concerning evidence for human-made impact, it would take a long time to go through it all. Of course, skepticalscience.com has tons of articles and listings linking to evidence. National Security and the Accelerating Risks of Climate Change (May 2014), by the CNA Military Advisory Board. Skeptical Inquirer Magazine and web site frequently has articles concerning Global Warming, Climate Change, and human impacts. People normally lead with their strongest argument. The Powell “study’ is nothing but a computer key word search of abstracts of scientific papers with no human analysis. It is nothing but a propaganda ploy. The data and methodology have to be made public so that disinterested scientists can replicate the experiment or observation to eliminate the possibility of bias, human error or outright fraud. The only peer review paper to even claim to hav empirical evidence outside of the laboratory was a study by Feldman et (Berkley labs). It was published in Nature in February of last year. Even if the paper is taken at face value (there are many problems with it), the paper only indicates that CO2 has a small effect that is easily overridden by natural forcers. You’ll be dead, and you won’t care about the $billions being spent on top of the already spiraling out of control national debt, by unscrupulous pols who are getting rich off this questionable science. Yep, let’s leave our unpaid debts to the children and their children. Because it’s “the right thing to do” and it makes you feel all warm and fuzzy and noble inside. Y’all think the planet is in trouble because YOU happen to be alive at this brief blink in a 4,5000,000,000 lifetime. It’s all about ME, and NOW! Debt isn’t erasing islands in the Pacific, melting Greenlands glaciers, and increasing drought conditions in the western U.S. Plus, debt can always be restructured, paid down, or refinanced. Strange to get worked up over that, then support trickle-down economic policies that haven’t helped pay down the debt (kinda hard to do that if you keep looking for wars to blow hundreds of billions of dollars on! ), but have helped increase income inequality and resulting poverty. But I have to admit, it’s an amazing feat of projection to turn concern for the environment and our descendants into a “ME” thing. Truly a bizarre perspective. “Belief” and “climate.” Not necessarily a crisis, but problematic, regardless of the anecdotes you may know. That’s why we’re gathering data globally, and attempting to better understand the phenomenon, rather than dismiss it and hope for the best, based on fairy tales told by industry-supported denier blogs. Science, not belief, should guide our decisions on this and other important issues of the day. You (your governments) are spending the money of our descendants for them with no feasible plan to pay it back, and without their consent, because YOU think you know best. You know what thinking folks say about taxation without representation? More politicized rhetoric, with no actual facts to back it up. It’s not the weather, Wilson, as you well know. It’s the future, and something you don’t have a real grasp on, since you seem to have solutions from the 19th century. I suppose you would have been opposed to moving from whale oil to coal if you’d been living in Victorian times. At least most folks seem to be smart enough to look over what you’ve got to say as the hot air it is. Have a good weekend! Consensus is not empirical evidence. It is a political argument and has no place in science. Resorting to a political argument is a propaganda technique to deflect from the fact that there is no empirical evidence supporting the AGW hypothesis. Professor Tol is a economist at the University of Sussex. Tol was a coordinating lead author for the IPCC Fifth Assessment Report Working Group II. “In their paper, Cook and colleagues argue that 97% of the relevant academic literature endorses that humans have contributed to observed climate change. This is unremarkable. It follows immediately from the 19th century research by Fourier, Tyndall and Arrhenius. In popular discourse, however, Cook’s finding is often misrepresented. The 97% refers to the number of papers, rather than the number of scientists. The alleged consensus is about any human role in climate change, rather than a dominant role, and it is about climate change rather than the dangers it might pose. Cook enlisted a small group of environmental activists to rate the claims made by the selected papers. Cook claims that the ratings were done independently, but the raters freely discussed their work. There are systematic differences between the raters. Reading the same abstracts, the raters reached remarkably different conclusions – and some raters all too often erred in the same direction. Cook’s hand-picked raters disagreed what a paper was about 33% of the time. In 63% of cases, they disagreed about the message of a paper with the authors of that paper. Note in particular Section 1.3 in the FAQ section. There is empirical evidence within the consensus. Much to the dismay of the GWDers. Additionally, this evidence overwhelms the contrary. Cheers! actually understand that many of your claims are false…The only thing I am “projecting” is data, evidence, and the considered judgment of many hundreds of climate scientists. gas” actually means anything?! Do you think that the “argument” that “4% of .04%” is necessarily an insignificant fraction of CO2 in the atmosphere carries any weight with scientifically conversant people?! You are being duped, Odin – pretty sad,really. There is no klimat problems in Norway. The same people have had problems because their herds are to big. Sorry Mr. Hansen, but you are wrong. 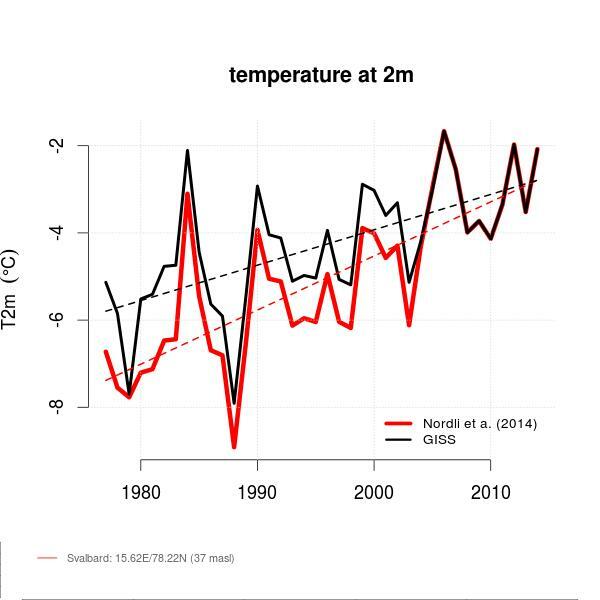 The temperature trend in the Norwegian Arctic, and resulting changes in sea ice, ecosystems, fisheries, etc. have been well documented with typical Norwegian accuracy — and they are unequivocal. You should also know that I’ve been to the Arctic in your country eight times now, including Bodø, Svolvaer, Tromsø, Kirkenes, Vadso, and Vardo. Few people who actually live and/or work in the Norwegian Arctic, including coast guard sailors, scientists, a priest (in Svalbard), Sami people, etc., etc., would agree with your assessment. In fact, your own government is gearing up for increased ship traffic in the Arctic, as well as oil and gas exploration — which is moving farther north as conditions warm and ice retreats. In case you are interested, here are two temperature analyses for Svalbard: http://www.realclimate.org/images//Svalbard-Nordli-giss.jpg They agree pretty well, and to say there is no warming would be to deny reality. Lastly, did you know that the average temperature for the past 30 days in Longyearbyen was -5.1 °C, an astonishing 10.8 °C above normal? : http://www.yr.no/place/Norway/Svalbard/Longyearbyen/statistics.html The highest temperature was well above freezing: 4.5 °C, on 24 January, which just happened to be my 60th birthday. I actually celebrated it in Tromsø, where I was attending the Arctic Frontiers conference. Why do you think they use that word “frontiers” in the conference name? The answer: Unequivocal warming in the Arctic region is opening up new areas for resource development, fishing, and other economic activities, while also bringing new environmental challenges. First i was talking about the temperature on mainland Norway and there is absolutlu no problems related to that and the Sami people. As you know Svaldbar had lots of ice last winter. Polar bears are reported to be fat as pigs. My relatives has been into fishing and whale hunting and have told me stories of changing weather in the northern ice dating back to late 1800. Some wery cold some years was much warmer. Trying to tell me that Sami never had problems with nature befor. Norwegian goverment had to force them to reduce their giant herds as they was destroying their land. So it must be very hard compered to his skiing grandfather. Family stories are not evidence. They measure nothing and are at best, stories specific to one place at one time by one eye witness. So if my grandfather tells me how they was sailing up north he had some reason to be lying. He was telling me facts long before the so called climat crisiss was a worry. Date, latitude and longitude? Can you give these? Now, satellites do not return the same values as the collected, adjusted and inferred ground based data, which includes (according to NASA) historical steamship cold water intake valves, glacial melting rates, and estimated (inferred) values for vast locations on earth where there are no instruments. The results are then posted showing their best “estimates” after all the necessary “adjustments”, but without the scientifically required disclosure of the “margin of error”, which one should expect in this kind of complex calculation. If you check out NASA’s ground based methodology, ERSST_v4: NOAA/NCEI’s Extended Reconstructed Sea Surface Temperature (ERSST) v. 3 and 4, you will see many references the the work of Climate Activist James (Hocket Stick) Hanson, and so many adjustments and arbitrary “normalizations, and that the heavy hand of man is well in evidence, rather than pure scientific measurement. Bottom line, until the scientists officially throw out satellite temperature obsservation, and post a margin of error in their manually produced charts, I will remain a skeptic. Yeah, let’s throw some more “stuff” at the wall. Anything to avoid the questions actually raised, one of which is why NASA will not show the margin of error in their much published and circulated chart. So, Einstein, the chart shows an anomaly of 0.80 degrees. Tell us is simple terms what the margin of error is in degrees? Looking at the right-hand error bar, it appears to be around 0.1°C. Let’s just dispense with comments like, “So, Einstein…” Yes, I know others do the same thing, or worse. But I can’t play whack-a-mole 24/7. So just do me a favor and give me one fewer mole to whack, ok? Thank you. 1) “This graph..” is blocked (403 error; forbidden). Thanks for no link to data…. 2) “NOAA publishes monthly global temperature data derived from satellite observations. According to the satellite date, the warmest year was 1998”. I believe you have erred (or lied! ): care to provide evidence for your claim? Care to provide a time series for the data that shows the trend to the present? 3) “but the whole debate could easily be settled by using a universally accepted scientific method..” Please note that the several methods that are in use converge on evidence of continued warming of the planet, right up to the present moment. This convergence of multiple ensembles of measurements has certainly convinced scientists of the truth of what is going on. They have moved on to an explanation of what is causing the observed warming. You are left in the hot dust, contesting the validity of the data, and so cannot even address whether there is any other plausible cause of the observed warming beside massive combustion of fossil fuels? Do you also contest the measurement of the fraction of the greenhouse gas, CO2 in the atmosphere at >400 PPM and steadily rising? 1. The link tells you exactly where you can find the satellite data. I have posted a (working) link many times here. 2. You then will see a link to the raw NOAA satellite data from which it is derived. Are you awere of that the start of your graf is from the end of the little iceage when climate was so cold that 2/3 of Europes population went extinct. Is tha your dream climat. Are you aware of that the start of your graf is from the end of the little iceage when climate had been so cold that 2/3 of Europes population went extinct. Is that your dream climat. It’s rather academic now, isn’t it? The issue is about how much warmer the planet is going to get, and the consequences thereof. There is no “satellite earth temperature data.” No technology exists to directly measure surface temperature from earth orbit. NOAA’s satellites measure microwave brightness in the stratosphere. Then UAH and RSS feed those measurements into an elaborate numerical model (which is frequently adjusted) to produce estimates of temperatures from three to ten miles up. That’s the “satellite data” that you hear (every day on the Glenn Beck show) are “more accurate” than thermometers on the ground. We are in the satellite era (and computers too) now! There is a difference between “directly measured” and “estimated.” Thermometers measure by direct contact. The product you showed a link to is the output of a complex numerical model. That makes it an estimate, not a direct measurement. RSS is quite up front about that. That’s why their web site says they derive temperature products. My termometers mercury is reciving radiation from the atmosphere. Temperature or energy can be messaured in many ways. Microwave radiation is one very good way to do it if noy the sientist would never constructed this expensiv program. Your thermometer is in contact with the atmosphere. It senses the temperature by conduction. If it’s also collecting significant radiation from somewhere, your measurement will be skewed. You should keep a thermometer in the shade. You are objecting to the adjustment of ground based data, then going to the satellite data? Ha ha ha ha ha ha ha ha ha ha ha ha ha. Did you really expect that on one knew that the satellite data is the most processed and adjusted of all? That there have been over 10 versions of the UAH satellite data. That getting the correct answer requires guessing correctly on how to correct for instrument degradation satellite drift, separation of stratospheric data from tropospheric data. And then, even if all this is correct, you are left with 1998 was the warmest year 5 miles up. You seem to have nothing. You dont understand a s… Raw data from NOAA’s super expensive fleet of satellites are avaliveble for all. There have been updates to the satellites soft ware over these 40 years for sure but manipulation of data is presentet to you via NOAA’s data simulations were input data from sea and land sensores are changed all the time. Satellite meassure ments is a part of this but all other sensor readings are constantly manipulated to make up new harcrut models. How much higher is the global temperature from normal the last 20 years. The efforts to reduce co2 levels should have started decades ago. Maybe this might help you understand. It takes thirty years for climate trends to become discernible above the weather noise. 2016 – 1998 = 18. What’s the big fuss over some weather noise? And why would you pretend weather noise invalidates the basic physics of the enhanced greenhouse effect? The Nature article raises the issue of your “enhanced greenhouse gas effects” and the accuracy of the global warming models that incorporate them. They not only raise the issue, but deal with them. I think it is dishonest that you didn’t mention that. Thomas Huxley wrote: ‘Science is organized common sense where many a beautiful theory was killed by an ugly fact’. I will be a talk by Kevin Trenberth tomorrow, and I’ll get to ask questions too. So I’ll report back what I gather, in a post here at ImaGeo. Excellent, I am truly envious, and will watch for your article. It would be interesting to know how he sees the debate on climate developing over the next few years. 2017 will certainly represent a regression to mean, and in that respect, the naysayers will undoubtedly make hay from that fact. Can the strength of the current El Nino be linked to the evident rise in Ocean Heat Content and also the exceptionally high air temperatures experienced this year in the Arctic or are there other mechanisms driving temperatures in the Arctic. And surprise, the missing heat did reappear and temperatures did spike once again. So when we read the entire article it shows the exact opposite of what you were claiming it showed. Remind me to be very, very suspicious of anything you post. And thanks for showing that I can’t trust what you post. The El Nino of 2015 just ended. El Ninos (which are a natural phenomenon) cause a spike in global temperatures. We could easily see temperatures continue to rise for the next several months. El NInos are usually followed by El Ninas which cause temperatures to drop. El Ninos and El Ninas are natural variations in the world’s weather. “an El Niño nudge” of 95%. The only record set is how big a fraud the temperatures you quote have become. In contrast, the satellite temperature which for many reasons is the only credible and near global temperature measurement we have, has failed to make any such records even though this is an El Nino year. And please … when we start seeing the global cooling later this year can we have the same level of reporting on the cooling – let’s see some more bogus faked up excitement during the El Nino cooling as we are getting from this brief warming. Mike, you regularly deride the surface temperature data and make bold claims about the satellite data, which you know is not a surface temperature. 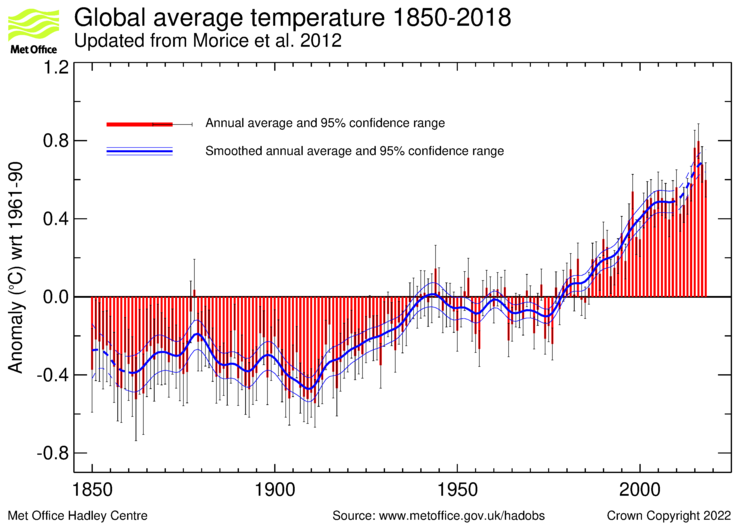 The surface temperature has been validated, despite the adjustments that have been made to it, and found to be reliable in showing the increase. Adjustments aside, the surface shows warming trends irrespective of these adjustments, and this is validated by natural indicators such as the start of seasonal melts, migration of birds, advent of spring. Such indicators really do put a lie to the satellite data reliability, and even REMSS admit this. You also know next year will be cooler, as the presence of an active El Nino phase boosts warming, so it’s absence will remove an extreme forcing of temperature. That does not mean next year will represent a “cooling” planet. Our planet will still be gaining heat, in the oceans and atmosphere. The approach you take and language you use is not rational, and you are prone to confirmation bias. I am keen to for you to answer a question on one of your previous posts. Let me remind you of it. It is also posted on your web site. It is interesting because looking at how ice is accumulating on one single day, namely the 18th of January, and extrapolating a conclusion from that means. Your conclusion from that page is that the Greenland ice sheet is growing. The attached graph does not represent an increase in any way you imply. I’d be interested to see your response to this point! How much higher is the last 10 years global temperatur from your ideal. I used to work in temperature measurement and meteorology and so I’m not some gullible academic who doesn’t know what they are talking about. 20th century as urban areas increased. would have dealt with them. It is interesting that you have deliberately avoided my question on your assertion that the Greenland ice cap is growing, which is clearly not this cast. How could you have been so wrong? I used to work in surveying. Theodolite readings produce many errors. Yet the first survey of Mount Everest was a theodolite survey from sea level. They were within a few feet of the actual height. Seems a remarkable achievement but the errors cancel each other out. Now Judith Curry has some good analysis on her web site regarding these readings. I’ll post the conclusion here for you to read. Points one to five are not backed up in reality. The remainder are specific cases, and in the bigger scheme, most likely have little or no effect on the global average. Investigate by all means, but with such large quantities of data, specific cases have little effect. Your use of the word fraudulent is gross. What is more, your view is not shared by the natural world, where in a massively unbiased way. Rising temperature is changing the seasonal patterns. That is not selective, yet you avoid discussing this point. Not the only point you fail to address. You are extremely selective in how you are assessing the climate. Your track record on denial is impressive. You have committed whole heartedly to disproving AGW. You have misinterpreted data on the Greenland ice sheet. You certainly now are in the unenviable position of being wide open to both confirmation bias fallacy and extremely vulnerable to the sunk cost fallacy. I cannot imagine you ever admitting you were wrong. I will admit to being wrong, were there evidence that that is the case. There is not. Our Arctic region is certainly under massive threat, and the whole Arctic ecosystem stands to being devastated by the warming that certainly is driven by greenhouse gases. More damage by humans on our planet is bad news. There is no harm in looking for better and more efficient ways for humans to behave so that our impact on this planet is lessened. People like yourself are barriers to a better future, your focus on technology and esoteric argument obfuscates the bigger problems that need addressing. I hold your position to be extremely misguided and I would suggest you come out of your current mindset and take a look at what we are doing to the planet. … because it was a stupid question. I get bored proving you alarmists wrong — it’s just so easy to do it. So you agree it is losing volume. Interesting. Surface ice requires greater snowfall, this would result from more water vapour in the atmosphere, and that is a predicted result of global warming. “No place for name-calling in debate” – Who do you think said this? 9. This Administration and their Cabinet and Agency Heads, have been demonstarbly lying to you, Pleading The Fifth, wiping their hard drives, wiping their servers, using their own bathroom servers for top secret communication, producing phony lists, fighting Congressional Supeanors, fighting Freedom of Information requests, even launching inter agency law suits to protect information. Information of course, that belongs to the taxpayer. It is so bad that PEW, a respectable polling organization found that 97% of your countrymen don’t really trust your government. Those are Banana Republic numbers, for you defenders of the status quo. This so called climate crysis is a hypotes that can happen if global temp gets 1 degree warmer by year 2100 im told by media. The world is comming to an end , the industry will not stop , the polution will keep growing everyone needs to prepare for what’s comming. Winter is autumn , spring is summer. Get ready for the end in less than 10 years.